Can the Body Store Vitamin C? Because vitamin C is a water soluble vitamin (it dissolves in water), your body doesn't store it well like other nutrients (fat-soluble vitamins). Vitamin C remains in your body for a period of several weeks after you stop ingesting it, according to Linus Pauling Institute. But, without a daily intake of vitamin C, you'll experience signs of scurvy (a disease caused by vitamin C deficiency) in a just one month's time, according to the Office of Dietary Supplements. The National Academies Press confirms that in healthy adults, scurvy can occur in just 30 days without vitamin C.
The reason vitamin C isn't stored well is because your body can't make it, and vitamin C is a water soluble vitamin. This means it dissolves in water, and what your body doesn't use right away is excreted through urine. In contrast, fat soluble vitamins dissolve in fat, and excess intakes of these vitamins (vitamins A, D, E, and K) are stored in fat tissue and the liver for future use. How Does Synthroid Interact With Vitamin D? Because vitamin C is poorly stored in your body, without ingesting it regularly (daily), you're at risk of developing vitamin C deficiency symptoms. Additionally, the University of Maryland Medical Center says insufficient vitamin C intake from vitamin C-rich fruits and veggies is associated with medical conditions - like certain cancers, high blood pressure, increased risk for heart attack and stroke, and gallbladder disease. Daily intake of vitamin C is important, recommends Colorado State University. When eating 2,000 calories per day, the Dietary Guidelines for Americans 2015 suggest getting 2½ cups of veggies and 2 cups of fruit in daily. Choose from a variety of vitamin C-rich foods. 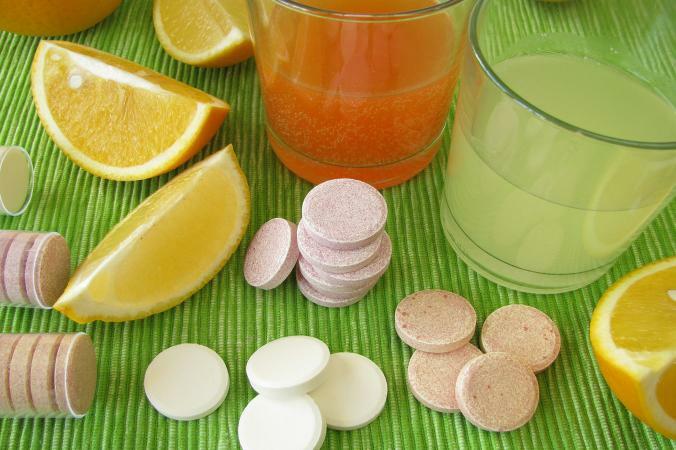 Additionally, look for a multivitamin supplement containing vitamin C if your doctor recommends it. The recommended dietary allowance (RDA) for vitamin C is 75 milligrams daily for women, 85 milligrams during pregnancy, 120 milligrams for breastfeeding women, and 90 milligrams per day for men. However, be aware the tolerable upper intake level (highest safe intake for most healthy adults) is 2,000 milligrams of vitamin C daily. The University of Maryland Medical Center says taking 500 to 1,000 milligrams of vitamin C each day may lower your risk for health conditions like heart disease and cancer and states the best way to take vitamin C supplements is two to three times daily with meals. While vitamin C can be stored in your body for short time periods, a daily dose of vitamin C is the best way to prevent vitamin C deficiency. Pick a variety of vitamin C-rich fruits and veggies daily and ask your doctor about taking a multivitamin supplement containing vitamin C.